Even if you're the smartest, strongest, most charismatic and most agile wanderer out in the wasteland, it still doesn’t hurt to have a little bit of luck on your side. Boost your luck! 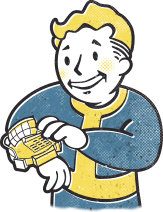 Add the new Fallout 76 5" Luck Bobblehead to your collection, it’s one of the 7 perks that makes you S.P.E.C.I.A.L.